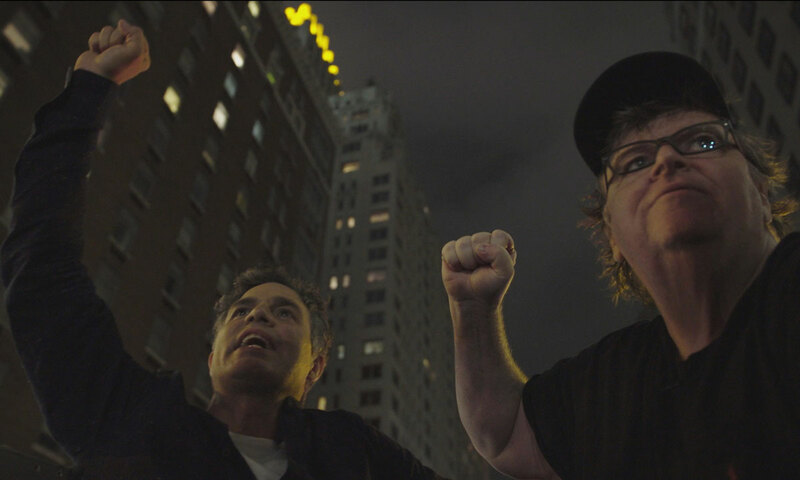 Filmmaker Michael Moore’s latest documentary is a dramatic exposé of rampant and long-term abuses of power in US politics – including a chilling example that left families in a Michigan town with severe health problems. Michael Moore with West Virginia State Senator Richard Ojeda in Fahrenheit 11/9. Even citizens who take up their optional right to vote in the US are powerless to decide who represents them, due to the country’s electoral college system and sheer fraud within it. This and other kinds of corruption are at the heart of Academy Award-winning director Michael Moore’s Fahrenheit 11/9. If his techniques often smack of showmanship, there is an undeniable heft to his message about the demise of democracy in America. Moore knows how to edit clips to produce dramatic effect, and how to dress these with music that reinforces events. We have seen that in Bowling for Columbine. When overdone, this risks obscuring serious issues with too much comedy but Moore doesn’t lose sight of his key questions: what’s going on in America, and how can the country be urgently improved? The film’s title refers to both Donald Trump’s ascension to the US presidency on November 9, 2016 (with an oblique squint at the 9/11 attack), and the despotic rule that is at the heart of Ray Bradbury’s apocalyptic novel Fahrenheit 451. While that association might seem forced, there is no getting around the rampant and long-term abuses of power in US politics, and the associated neglect of a major part of the country’s social needs. There are many quotes from Trump, such as those where he celebrates how he “plays the media for suckers”, says he would date his own daughter if circumstances were different, and that he doesn’t care if the electoral system is rigged because he won. The Clintons and Obama come off badly, too, as do several other targeted politicians who put themselves before their constituents. Actor Mark Ruffalo and Michael Moore at a protest rally against Donald Trump in Charlottesville. Frightening and blatant electoral fraud conducted at the highest levels gets aired. Hope for change is canvassed with the possibility of a grassroots representation sidestepping the big parties, involving a particular focus on the growing role of women as delegates, and a younger generation confronting leaders who have failed them. For each positive move, however, Moore provides a chilling counter. A large section of the documentary concerns the unchecked and cruel abuse of power in Flint, Michigan. Its population was subjected to a filthy water supply for years when a new and privatised pipeline was being built. Clinical tests that confirmed this were manipulated to hide the serious level of poisoning. While families (and, most worryingly, their growing kids) suffered permanent and severe health damage, big business that financially supported the politicians got clean water to avoid corrosion of its products. There was also an unannounced and large-scale military bombing of empty parts of Flint at night, a training exercise conducted without warning and causing great alarm to the city residents. It’s hard to believe but the film vision proves it. It might sound like resignation, but this is uttered as a sign of optimism, a call to action in the face of continuing exploitation and neglect of the wider US population. Moore wants freedom rather than safety, and this film forcefully argues for that need.